I have signed up for my very first Online course. It is not about quilting but about Dog Training. I have signed up for Susan Garrett's Recaller's 4.0. 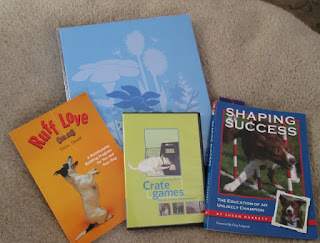 Wednesday was the first real day but there has been tons of reading and precourse work and dog games. 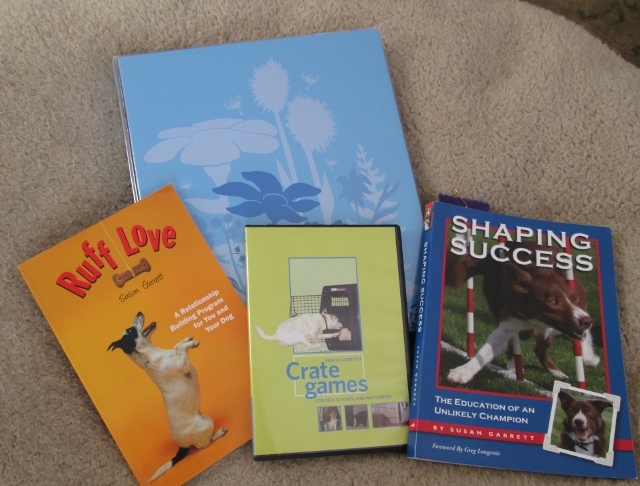 I have spent the last 10 days reading and working with my dog in this new(new for me) way of dog training. I see a few changes in my dog already. I am hoping it will help with our Agility runs. The books in the above photos is only a small part of my reading. The course forum has had lots to read and videos to review. I have had homework to write out like, what are distractions for my dog. What reinforces my dog. I still need to go add more to this lists. The blue binder is my book to keep records. I think I may make a fancy quilted cover for the binder. 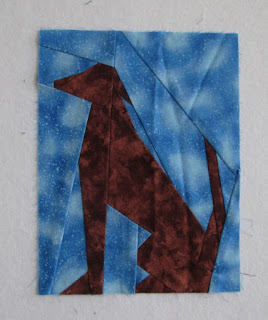 I found this old paper pieced block I designed about 10 or 14 years ago. It is a brown dog sitting and being good. The block is stolen from an old UFO. So I may have to remake it so the old UFO is still complete. I really hope to get in some personal sewing in tonight and Friday night after work. I need to get back to my orange scraps or some old UFO projects. Love your brown dog. He really is behaving.